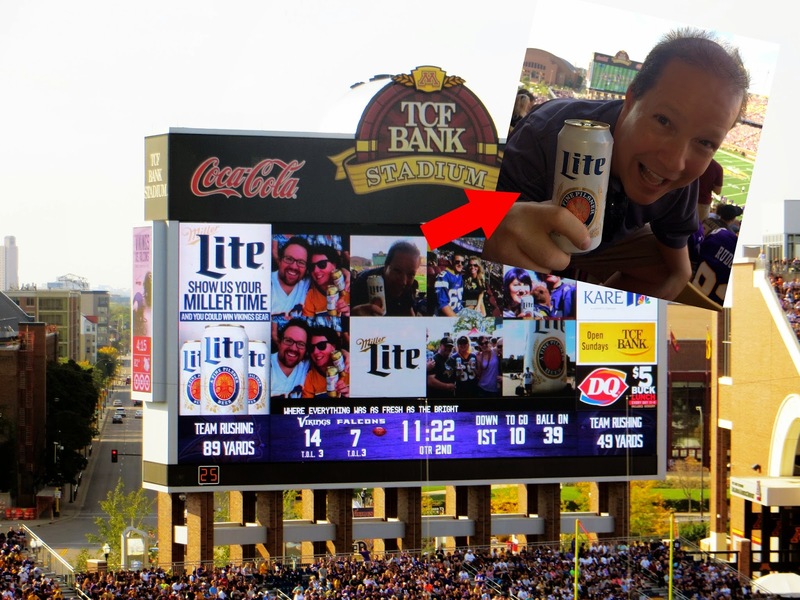 On Sunday, we were all pumped up to go to our first outdoor NFL game at TCF Bank Stadium at the University of Minnesota to see our beloved Minnesota Vikings take on the Atlanta Falcons. We were quite grateful to be able to go to the game. Luke had just completed his liver biopsy the week before and had to go the emergency room two of the previous three days before the game and was moving pretty slow the day before. But he assured us he wanted to go to the game and could handle it. Lucky for all of us, he was right! There was a new message on the big screen that I hadn't remembered seeing before. Sign of the times. Miller Lite invited fans to tweet them a picture and it would be displayed on the big screen. You know I can never pass up an opportunity like that! Then we saw the cheerleaders come streaming on to the field and we knew the action was set to begin! The offense was featured this week so we got to cheer on our young stars like Cordarrelle Patterson. We pledged our allegiance to the flag and then cheered like mad men to get the party started! The big news of the week was the first NFL start of our rookie quarterback, Teddy Bridgewater. He was just awesome to watch! We've had a lot of quarterback issues in Minnesota, so we keep hoping to find someone who can lead our team for the next decade. It's only been one game so far, but Teddy's future looks quite promising! Teddy led the team to a 41 - 28 victory over the falcons, passed for 19 of 30 for 317 yards, and had no turnovers. The team looked awesome and had an aura of confidence about them I hadn't seen in quite awhile. Of course, Bridgewater injured his ankle near the end of the game which is typical Minnesota Viking luck. The same team without their rookie quarterback was rumored to have gone on to play another NFL team 5 days later and got destroyed, but I'm not sure I believe that could be true. Because the team I saw looked great! Our first outdoor NFL game was a big hit with the family! It was so much more fun seeing the blue sky rather than the dirty old metrodome roof! We're supposed to go to another game in November, so if we have an early winter in Minnesota and that game is incredibly cold or snowing then I'm not sure we'll feel the same way! On Friday night, we had Grandma Linda over for a roast. Grandma Linda likes roast. After dinner, our friends, Jason and Jen, came over to take me to the casino. Jason likes the casino! On Saturday night, we connected with the Zitzewitz Family to go to Benihana at the Mall of America. Karl likes Mexican people cooking us Japanese food.